outfalls: poems and drawings, Harriet Tarlo and Judith Tucker, Wild Pansy Press, 2018. Edition 250. 148 x 105 mm. 34 pages. This book comprises a selection of paintings and poems from the series: behind land, and is an extension of a collaborative commission funded by the Arts Council and curated by Linda Ingham as Excavations and Estuaries. The work responds to a part of the North East Lincolnshire coast that might be considered the epitome of a landscape in which the human and non-human are interconnected and entwined. It is a place that invites questions about what is natural, and what is unnatural. Between 2011 and 2013 , poet Harriet Tarlo and visual artist Judith Tucker collaborated on a series of walks, drawings and poems around the cloughs and becks of the Holme River in West Yorkshire. Their work conveys a sense of the symbiotic shaping of land and water both by each other and by human interventions, as well as their own conversations with the landscape and with each other. This book contains drawings and poems from this project. 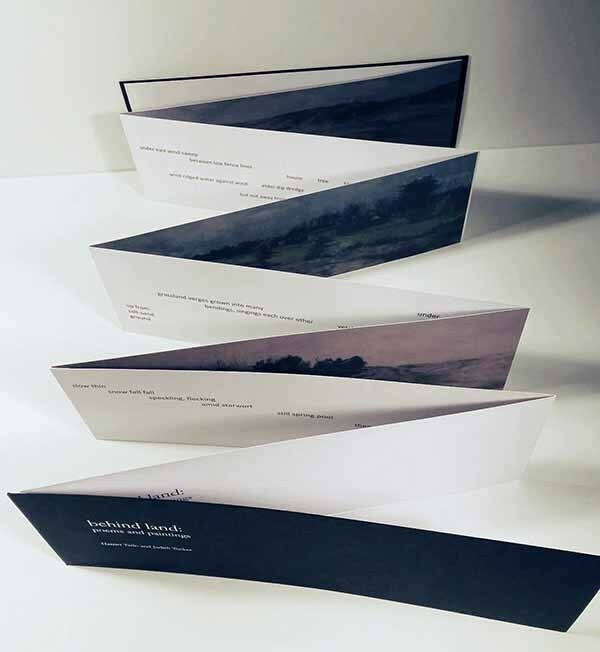 PRICE for each artist book £20.00 + p & p.
Judith Tucker is an artist and academic, her work explores the meeting of social history, personal memory and geography; it investigates their relationship through drawing, painting and writing. She has a long-term collaboration with the radical landscape poet Harrie Tarlo. n 2018 she was a finalist in the Jackson’s Open Painting Prize and she has been selected to be one of ten UK artists exhibiting in the first Sino British Contemporary Biennial, Yantai Art Museum, China. In 2019 her work features in Made in Britain: 82 Painters of the 21st Century in The Muzeum Narodowe w Gda?sk (National Gallery of Poland, Gdansk). Exhibition venues include Arthouse1 and Collyer Bristow London and many regional galleries throughout the UK, and further afield in Brno, Czech Republic, Vienna, Austria, Minneapolis and Virginia USA and Yantai, Nanjing and Tianjin in China. She is co-convener of the Land2 and is part of Contemporary British Painting, a platform for contemporary painting in the UK. Tucker also writes academic essays which can be found in journals and in books published by Rodopi, Macmillan, MUP, Intellect. She is Senior Lecturer in the School of Design at the University of Leeds. Harriet Tarlo is a poet and academic with an interest in landscape, place and environment. Her publications include Field; Poems 2004-2014; Poems 1990-2003 (Shearsman 2016, 2014, 2004); Nab (etruscan 2005) and, with Judith Tucker, Sound Unseen and behind land (Wild Pansy, 2013 and 2015). She is editor of The Ground Aslant: An Anthology of Radical Landscape Poetry (Shearsman, 2011) and special poetry editor for Plumwood Mountain 4:2 (2017) href="https://plumwoodmountain.com/>https://plumwoodmountain.com/. Critical work appears in volumes by Salt, Palgrave, Rodopi and Bloodaxe and in Pilot, Jacket, English and the Journal of Ecocriticism. Her collaborative work with Tucker has shown at galleries including the Catherine Nash Gallery Minneapolis, 2012; Musee de Moulages, Lyon, 2013; Southampton City Art Gallery 2013-14; The Muriel Barker Gallery, Grimsby and the New Hall College Art Collection, Cambridge, 2015. She is a Reader in Creative Writing at Sheffield Hallam University.